For about the past decade-and-a-half fantasy blockbusters have not only stunned audiences with their visual effects, but they have also managed to procure an ensemble of some of the world’s greatest actors. So you would think, with the presence of The Lord of the Rings alums (Ian McKellen, Orlando Bloom, Christopher Lee, Cate Blanchett, and Hugo Weaving) coupled with the incomparable talents of Benedict Cumberbatch and Martin Freeman, that this final installment in the long-winded Hobbit trilogy would be up to snuff. However, you would be mistaken. Six of these seven actors have an astonishingly minimal amount of screen time, which is especially odd for Martin Freeman, given that he is the hobbit. Instead of relying on his truly talented actors, who know how to be epic without being excessively corny, Peter Jackson chose instead to showcase the talents of Luke Evans, Evangeline Lilly, Lee Pace, and Richard Armitage. And I am sorry to say that they were all rather like excited children trying to recreate an epic scene from a film they’ve seen over-and-over. However, the crown for the corniest acting in the film goes to Richard Armitage and his overacted performance of Thorin Oakenshield. Though, I would chalk some of it up to the writing, because he had such long, redundant monologues. Now, Orlando Bloom did get quite a lot of screen time, but it was fraught with tempestuous and inessential love triangle between Legolas, Tauriel, and Kili and an overabundance of CGI acrobatics. Three geniuses (Fran Walsh, Philippa Boyens, and Peter Jackson) struck gold with their adaptation of The Lord of the Rings trilogy. How could they possibly go wrong with The Hobbit, especially when bringing in one of my favourite filmmakers, Guillermo del Toro, to collaborate with them? Well, they somehow managed. The most-prevalent factor that I think contributed to the failure of The Hobbit screenplays is Peter Jackson’s blind greed. With The Lord of the Rings, his goal was to bring the epic world of Middle-Earth to life. 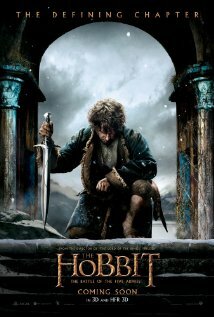 With The Hobbit, his primary goal was to make as much money as possible. I am totally behind Hollywood on their decision to split movies into more than one film, as long as they’re staying as true to the story as they can. Sometimes, a novel cannot be adapted into one single movie. But The Hobbit films are a muddy, bloated conglomeration of The Hobbit, Middle-Earth lore, and things that the filmmakers decided to create to “enhance” the film. Tolkien’s Hobbit is less than 300 pages in length. There is no reason that the story couldn’t be properly adapted into one film. But Jackson decided to make it into a trilogy, at great expense to every aspect of the film, but most especially the screenplay. There was an abundance of recycled lines. Gandalf: “The battle for the mountain is about to begin.” – The Hobbit: The Battle of the Five Armies. Also, were-worms? I didn’t realise they were adapting Dune into this film, too. Everyone in this movie was white. Except for the one Asian extra. I hesitate, briefly, on making this film fail in the aspect of its female characters. Both of the two major females, Galadriel and Tauriel, are incredibly powerful and skilled elves. Even one of the female Lakemen took no nonsense from the spineless sleaze, Alfrid Lickspittle. Nevertheless, at some point in this movie, all three of these women had to be rescued by a male character. None of the women speak to each other, so it fails the Bechdel test. Tauriel never existed in the book. She was created entirely for a romantic aspect; and what’s worse is that the romantic aspect was a love triangle. How cliché. While sometimes beautiful and enrapturing (particularly with the terrifying Smaug), the visual effects mostly made me feel like I was watching someone play a video game. Those times were preponderant during the battle, which was practically the entire movie. The worst of it was during Legolas’s battle with Bolg the Gundabad Orc. I really didn’t like the way any of the trolls looked. There was a haziness to the film that created a nice ethereal atmosphere. But it also felt slightly cartoony. The music was pretty, but there really wasn’t anything memorable about it. The sound, though, was spot-on. This isn’t even losing points for its faithlessness to the book. It’s losing points here because they failed to explain how Gandalf, Galadriel, and Elrond suddenly forgot about the threat of Sauron between The Hobbit and The Lord of the Rings. Maybe I’m being too harsh by giving it a three, but that just seems like a really huge, glaring plot hole. I have been corrected by a couple of my friends on this, who are much more versed in Middle-Earth lore than I am. Gandalf and the rest of the White Council did not forget about Sauron. They knew he was biding his time. What they were not aware of was the One Ring. The Hobbit, alone, is a fun little story that is chalk-full of adventure. Peter Jackson’s The Hobbit trilogy is an over-bloated and contrived mess that is chalk-full of fillers. But beneath the surface is the story of the hobbit who became a burglar and helped a band of vagabond dwarves reclaim their kingdom and their treasure from the greedy dragon Smaug. The Lord of the Rings trilogy is an epic adventure that many of us embark on time and time again. The Hobbit trilogy is a failed attempt at emulating that, and The Battle of the Five Armies is the worst of them. The scenes are dragged out to death, except for Smaug’s desolation of Esgaroth. We were given a whopping 5 minutes with the dragon before Bard smote him, following the wait of an entire year after watching Smaug sore off toward Lake-town uttering the bone-chilling line, “I am fire. I am death.” And yet, the synopsis for The Battle of the Five Armies reads, “Bilbo and company are forced to engage in a war against an array of combatants to keep the terrifying Smaug from acquiring a kingdom of treasure and obliterating all of Middle-Earth”. Now I have read the novel, so I know that Smaug isn’t alive during the Battle of the Five Armies. But they’ve changed everything else; why wouldn’t I just assume (or hope) that they’d let Smaug make it at least halfway through the movie? Nope, they kill him off in 5 minutes. Yet Thorin’s battle with Azog went on for ages. Tauriel’s plight to save Kili, while Legolas rushed to save her, was never-ending. Both Kili and Thorin’s deaths were so long, I just wanted to scream, “Just die already!” at the screen. There are moments of assumed epicness that are punctured by Thorin’s slow-motion monologues. It’s one thing to say a line or two at a sluggish speed, but (unless you’re Alan Rickman) you have no business delivering an entire monologue at the speed of a snail on the back of a turtle in a tar pit. And unfortunately, Thorin had two of these monologues.